Rubber goods are utterly indispensable for the modern civilization. But waste rubber is an environmental disaster to the same extent. Fortunately, this disaster can be avoided by converting it into energy source. The tyre deposited in a landfill (often not in a proper legal way) decomposes naturally during the period of more than 100 years. Rain water leaches out toxic compounds into the soil. Fire at the landfill where tyres are deposited is very hard to extinguish since the calorific value of tyres equals the one of a crude oil. There are two basic ways of rubber disposal: mechanical and thermal. The mechanical processes are aimed to rubber crumb production, which does not chemically differ from the feedstock. Thermal processes are focused on the energy potential of rubber. By US standards one tyre has an energy equivalent of 7 gallons of oil. Granulating the rubber makes marketable product, however it has several disadvantages, the biggest of which is energy consumption and quick breakdown of the grinders because of strenuous task they perform. The knives are made from hard steel, which is expensive and all this makes the granulating rather inefficient economically. 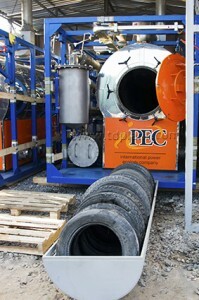 Thus, the thermal process of recovering energy from waste rubber comes more and more into focus of attention.